Why are old comic books expensive? Supply and demand. There's not very many copies of Action Comics #1 floating around any more, and a large number of people who would like to have a copy. Some of those people are willing to pay more than others, so that drives the cost up. But why aren't there very many copies of Action Comics #1 left? The first print run was something like 200,000 copies so why are there only about 100 left? It was the first appearance of Superman after all, and even back in 1938, people immediately saw how popular he was! Well, not quite immediately. After the first issue, Superman doesn't appear on the cover of the comic again until #7 and doesn't start appearing on the cover regularly until #14. The knock-offs that other publishers tried didn't start until mid-1939 with Victor Fox's Wonder Man, right around the time Superman started appearing in his own title. The radio series and Fleischer cartoons didn't come until 1940 and '41 respectively. So there was easily a year between Superman's debut and when people started to realize that this might have some larger cultural impact. Probably two or three years before people started thinking, "Hey, maybe this isn't a fad!" Remember that, while Jerry Siegel and Joe Shuster believed in their creation from the start, no one else really did, with many publishers rejecting the idea citing that it was too fanciful. There was no reason to think, in 1938, that Superman would be around two or three years later, much less three quarters of a century. 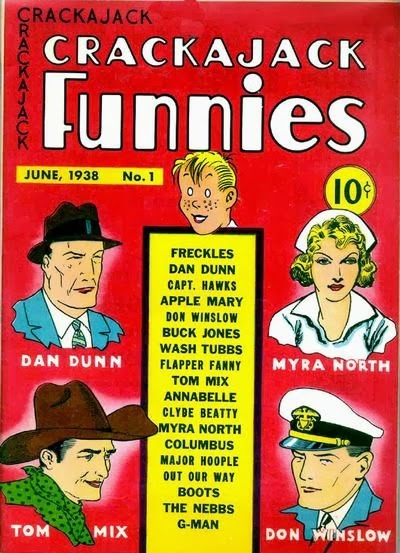 Action Comics #1 was seen at the time as no different than Crackajack Funnies #1, which came out at about the same time. They were both anthology comics with a broad mix of genres/styles inside. Never heard of Crackajack Funnies? That's because nothing significant happened in it, and no one of note worked on it. But, in 1938, Siegel and Shuster were no one of note either. Neither were Fred Guardineer or Shelly Moldoff, who also both contributed to the issue. So there was no reason for anyone to pay particular attention to Action Comics #1. At least no more attention than they might pay Crackajack Funnies #1. It's only with the passing of time, and a growing body of work, that we can see how and why Action Comics #1 was important. Had National (the publisher now known as DC) gone bankrupt or decided to stop publishing comics -- if they essentially stopped producing Superman stories in that first year or two, Action Comics #1 would be just as much a footnote as Crackajack Funnies #1. But because Action was successful and continued to be successful, that's why we can look back at #1 and cite its importance. By that time, though, we've moved on as often as not. We, as an audience, generally don't recognize success as it's starting to build; we only see it once it's reached some critical mass. And by that point, we're a ways removed from the original. The original that we may have dismissed or discarded at the time. We can't hold on to everything, and we passed judgement on it at the time, deeming it irrelevant or insubtantial. And that's how we get down to 100 copies of Action #1. By the time we got to Showcase #4 or Amazing Fantasy #15 or Incredible Hulk #181, we'd collectively seen enough debuts that we had started actively looking for them. We were hoping to find the next Superman so we were holding on to more. But even here, those issues were in the midst of other debuts and it's only in looking back where we find that Flash and Spider-Man and Wolverine stand out from the Frogmen (Showcase #3), Ozarr the Mighty (Amazing Adult Fantasy #14) and -- I swear I am not making this up -- 'Crackajack' Jackson (Incredible Hulk #182). My point is that you can never predict what's going to be successful. You can only look back on the histories after it becomes successful and that, to me, is part of the fun of comics. Going back and rooting through those histories that other people tossed aside. Also a less significant, though still poignaint, secondary point: stay away from any comics that use the name Crackajack. 1) Comics were shipped overseas to the troops as quick disposable reads. 2) Comic books (like all paper products) were collected in "paper drives" for recycling both for homefront and military use. Well, sure. And paper is inherently fragile so a lot of old comics got lost just to the ravages of time. But I was trying to focus on why two comics produced at the same time might cost vastly different amounts in the secondary market and why Action #1 might be more sought-after than Crackajack #1.